As any Brightonite knows, certain parts of Kemptown can feel pretty hectic. As you cross Old Steine and head up St James Street, it can feel as if your skills in people dodging, bobbing and weaving are being put to the test. 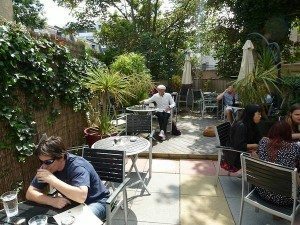 Kemptown is an eclectic and busy slice of Brighton life with its own distinctive feel and personality, and an appropriately colourful mishmash of characters and businesses. About half way up the street on the right hand side is the café Morris and Jacques, which offers a welcome oasis of calm: a respite from the hustle and bustle outside. It’s a fairly small place that’s tastefully decorated, with green walls and vibrant red panels, blackboards with inspiring quotes and dark wooden tables and chairs. The colour scheme creates a homeliness that’s comfortable and inviting. And, as a contrast to the warmth inside, there’s also a surprisingly spacious rear garden that’s a guaranteed gem in the summer months. 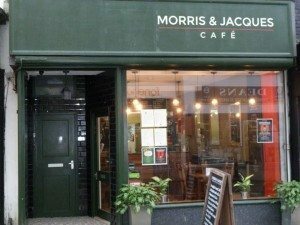 During the week Morris and Jacques operates as a daytime café serving food for reasonable prices, including some great all-day fry-ups. The ‘M&J’s breakfast’ for £6.50 is a hearty choice, comprising butchers’ sausages, two rashers of back bacon, black pudding, grilled tomato, fried free range egg and toast. They also do other egg dishes, including Eggs Benedict with poached eggs, ham and hollandaise sauce, Eggs Florentine with spinach and Eggs Royale with smoked salmon. In all dishes they use free-range eggs, which I felt very heartened by as the kitchen are clearly ethical in their culinary expertise. For lunch there are lighter bites too, such as the ploughman’s platter with home-roasted honey glazed ham and mature cheddar cheese (£6.95), salads with chicken or halloumi (£6.95) and various sandwiches and toasties (£3+). According to reviews from satisfied diners M&J has made its mark as a failsafe café. So, the owners have made an informed, sound decision to open up in the evenings at weekends. The atmosphere is different after dark. Candles appear on the tables and sparkly lights adorn the windows to lend a sense of occasion, and on the night I visited the dining room was busy, which is always a good sign. 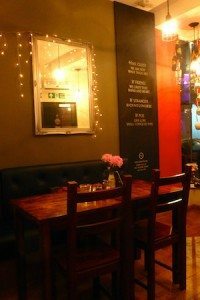 The café website describes the dinner menu as “small but perfectly formed” containing a mix of English favourites and Mediterranean classics. It’s not so small though as to be limited, as one can order any of the salads and platters from the daytime menu in addition to the evening specials. All in all there’s lots to choose from and the range of dishes is enticing; reminiscent of food you’d find in a modern bistro. My friend is vegetarian so her choices were more restricted than mine, but there were still a few dishes to tempt her. She doesn’t have a big appetite though so only wanted bread for her starter, which the manageress kindly offered to enliven with some accompanying hummus and olives. 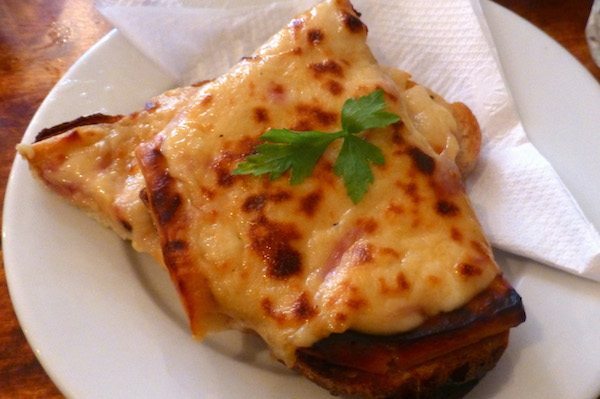 In the meantime I ordered a starter of Welsh rarebit made with Harvey’s beer, which I was told was a tangy and moreish choice. For our main courses my friend chose the classic Italian dish aubergine parmigiana which is served with a side salad, and I chose the pork belly with olive oil mash, broad beans and gravy. To drink we each had a glass of wine. I had the Allamanda Pinot Grigio Blush rosé my friend went for the red Chantebelle Merlot. When the starters we arrived we were both impressed. I’d never eaten Welsh rarebit before as a starter – I think of it as more of a lunch dish, to be honest – but it was exactly as described and a great option. It’s a generous portion and very rich and creamy, so bear that in mind when ordering. 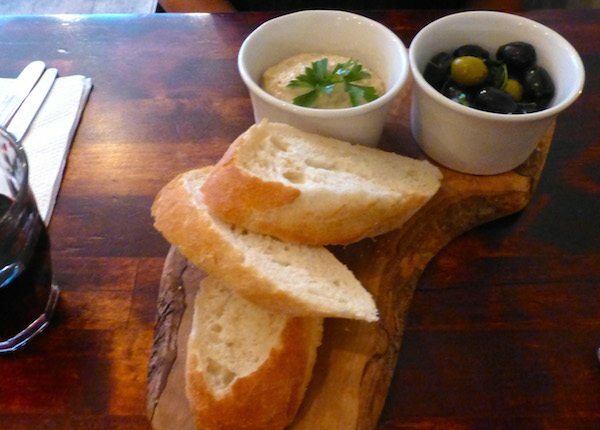 My friend’s bread very fresh and served warm, with homemade hummus and a good side dish of olives. When our main courses arrived our appetites had diminished a little, but this didn’t affect our enjoyment of the food. Both dishes were well executed and delicious. My friend’s aubergine parmigiana was, again, a sizeable portion baked in its own round dish and topped with a cheesy crispy crumb. 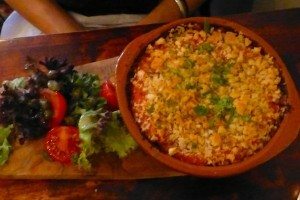 It was a great combination of herby tomato sauce with béchamel, aubergine slices and cheese – a definite hit with my friend. 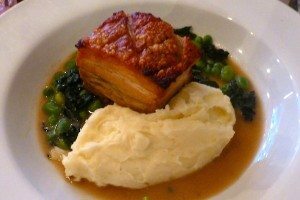 My main course looked fantastic; the pork belly had just the right amount of crackling and worked really well with the creamy mash. The gravy was just the right consistency and flavour, and I really enjoyed the addition of broad beans and greens, which added a splash of colour. 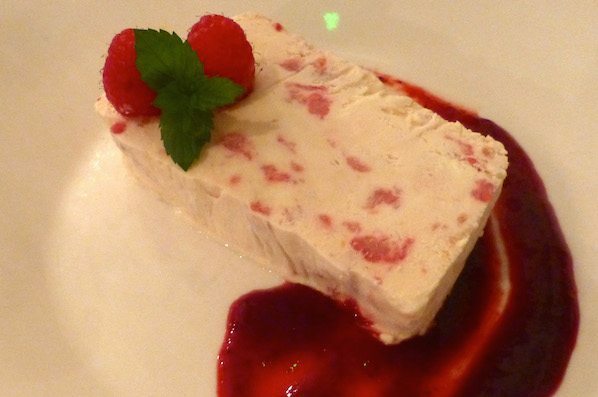 After such fulsome starters and mains, my friend and I were unsure about a dessert but were told the iced raspberry terrine was light and refreshing. We decided to order one portion to share and I’m so glad we did – it was a lovely way to end the meal. Served with a large swirl of berry coulis and two fresh raspberries, presentation and taste were excellent was excellent. At £12.50 for two courses and £15 for three, one really can’t go wrong at Morris and Jacques. I was impressed with what you get for that price and, as a Kemptown resident myself, I’ll definitely return. There’s a sense of care and honesty about the place that I really liked. All in all a good meal in a lovely place.